The best views in New York you’ll have standing on top of New York’s viewpoints. You can find many different viewpoints throughout the city. The most famous observation decks are the Empire State Building, Top of the Rock and One World Observatory. 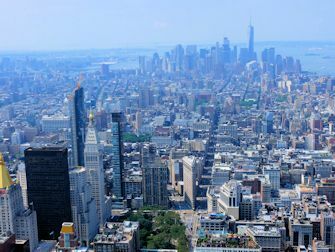 Not only high-rise buildings, such as rooftop bars, will give you a breathtaking view: You also have a splendid (skyline) view of the city that never sleeps from the Brooklyn or the Manhattan Bridge, the Staten Island Ferry and from many parks. I’ve made a list of my favourite viewpoints for you. What better way to really take in the whole of Manhattan than to board a helicopter flight. It really is an unforgettable way to see all of Manhattan. So for the best views, memories and photos I recommend to book a New York helicopter tour. I have done several flights myself and recommend it to everybody. Another beautiful and unique view of New York is from the 70th floor of Top of the Rock! The building is located right in the middle of Manhattan and you can take a 360-degree walk around the observation deck. The view is spectacular from every single corner. From Top of the Rock, you have the best views of Central Park, even better than the Empire State Building. You’ll overlook the Brooklyn Bridge, Empire State Building, Chrysler Building and more top attractions! Besides Manhattan, you also see Brooklyn, New Jersey and Queens. Eric’s Tip: A trip to New York isn’t complete without viewing the city from above. If you go for the first time to New York you cannot miss the Empire State Building. It’s the icon of New York and you will recognise it in every movie and TV show that you will ever see. But, the Top of the Rock has a nicer view over Central Park during daylight and… You can see the Empire State Building. Get one of the discount passes for in New York to enter these attractions with a discount. Entrance is included with the pass, so if you have the opportunity to visit both, go to Top of the Rock during the day and to the Empire State Building at night (after 21:00). Who doesn’t want to enjoy marvellous views on a rooftop bar while having a drink or enjoying a chic party? Choose one of the many cocktail bars to admire the New York view, while sipping from your beverage. My favourites are the rooftop bars of the Gansevoort Hotel and 230 Fifth. You can dine and party at both bars. 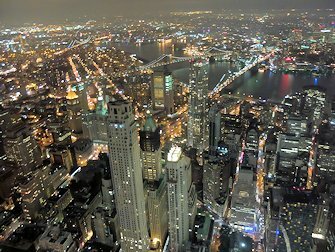 Once at the top you’ll be amazed, you’ll have a great bird’s eye view of Manhattan. You can also choose one of the many other rooftop bars, close to Times Square, for example, or in SoHo. Having a hard time deciding? Then the rooftop bar tour will be perfect for you! Note: the minimum age is 21 and up. Not 21 yet? You might be able to get into the lounge club in the afternoon. The Statue of Liberty is located on Liberty Island, you can reach it by boat from Battery Park (Lower Manhattan). Liberty Island is a national park. You can choose from two viewpoints: the pedestal and the crown. Keep in mind that for the crown the tickets are limited and often sold out months in advance and that you have to take the stairs through a very narrow staircase to go up. For stunning views of New York you don’t have to enter the Statue of Liberty. You can already see a lot of New York from Liberty Island. Another great option is to admire city views from the water. You can head to one of the bridges over the East River, hop on a ferry or book one of the boat tours in New York. Standing on top of a boat, on top of a bridge or relaxing in the park with the water in front of you only adds to the view. NYC Ferry is a network of ferry routes on the east side of Manhattan. For just $2.75 per trip, you can take a ferry ride and enjoy beautiful skyline views. There are a few different routes, for the best view, I recommend taking the East River Route or the South Brooklyn Route. All ferries have a bar on board where you can get coffee and snacks as well as wine and beer. Want a beautiful view without paying anything? Hop on the Staten Island Ferry! 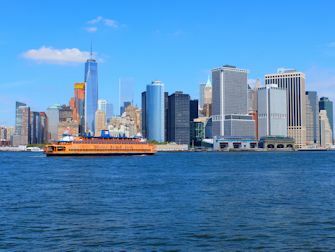 A free ferry that connects Staten Island to Manhattan. It shuttles 104 times a day and this way you can enjoy Manhattan’s skyline at any time of day. Moreover, you sail right past the Statue of Liberty. Make sure to look the other way as well, since you’ll be looking over the Brooklyn and Manhattan Bridge that way. Brooklyn Bridge is a real attraction. I’m sure walking across the Brooklyn Bridge is on your to-do-list. 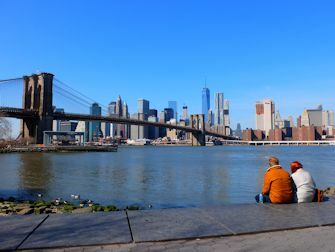 Don’t forget to combine this with a visit to the Brooklyn Bridge Park. Walk down Washington Street and you’ll spot the park straight away. You have an amazing view of Manhattan from here! It is the perfect place to relax in peace and to see Manhattan from a distance. Eric’s Tip: If you visit the Brooklyn Bridge and Brooklyn Bridge Park, first take the subway to Brooklyn. If you go from Manhattan to Brooklyn crossing the historical bridge, you have your back turned towards Manhattan’s skyline. And that’s a pity! I recommend to go to Brooklyn Bridge Park first and take some time to relax. You can then start your walk and see the beautiful skyline coming closer as you go. The Manhattan Bridge connects Canal Street in Chinatown to Downtown Brooklyn. From Manhattan Bridge you have a good view of Chinatown, but certainly of Manhattan’s skyline as well. It’s easier to take a skyline photo from this bridge than from Brooklyn Bridge, since you won’t have any steel wires in your photo this way. The trail runs on the side, so the view is superb. Weehawken is located on the other side of the Hudson River in New Jersey. As Weehawken’s boulevard is across from Manhattan’s skyline, you can imagine the wonderful views. You can take one of the Hudson River Ferries from Manhattan. 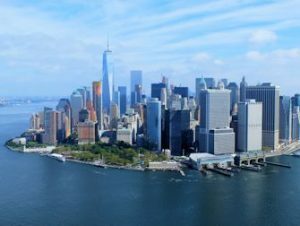 It’s 20 minutes from Manhattan World Financial Center terminal, Manhattan Pier 11 / Wall Street terminal or Manhattan Midtown / West 39th Street terminal to Weehawken. From West 39th Street terminal one way costs $9 and children aged 6-11 can hop along for $6. You can enjoy some nice views while crossing the Hudson River! Once at Weehawken, cross the tram rails and take the stairs up. You’ll actually look down on the Hudson River. Walk down the boulevard and take a moment to sit down. It’s a spectacular view, especially at sunset!